Wm. A. Selser, Bee Farmer and Breeder of Italian Bees & Queens. Blossom Nectar and Beeswax. Jenkintown, Pa. (Philadelphia: Craig, Finley & Co., ca. 1900). 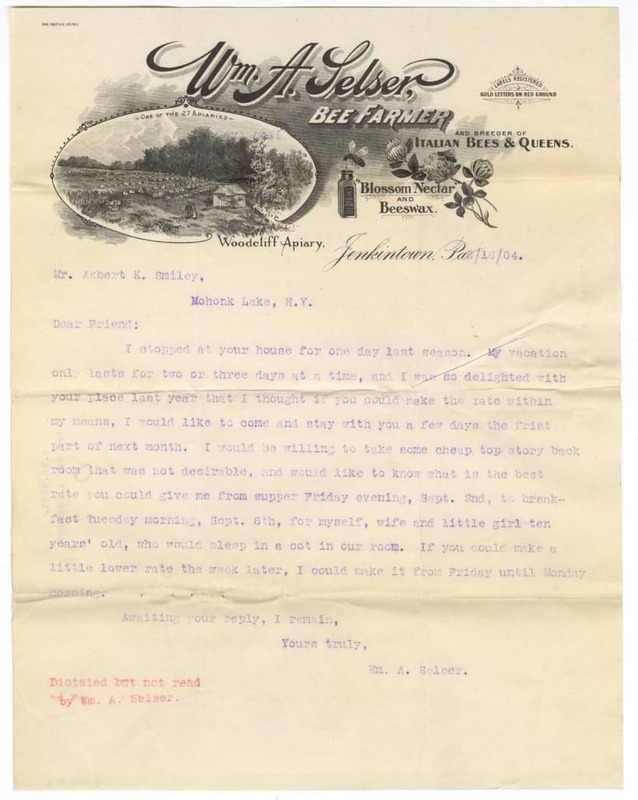 In August 1904 Jenkintown beekeeper William A. Selser (1858-1928) sent a typewritten letter to Albert K. Smiley (1883-1964) requesting the rate for a room at his retreat in Mohonk Lake, NY Over 100 years later this summer missive now lives in the collections of the Print and Photograph Department. Acquired for the eye-catching graphic design of Selser’s apiary “Woodcliff” by Philadelphia lithographic firm Craig, Finley & Co., the letterhead, as so often happens with our new acquisitions, is a visual artifact representing many seams of a historical web of the everyday. Selser, born in Philadelphia in 1859, came to his career as a bee famer from his favorite pastime of bee keeping. Originally trained as a tanner of morocco, Selser partnered in a fruit import business and then a morocco manufactory before establishing his apiary in 1893 in association with honey industry maverick A. I. Root Company. Known as a bee expert within his trade, Selser lectured about the behavior of bees to his peers, was a lauded entrepreneur for his honey production practices, and promoted the medicinal properties of the insect’s venom. Selser was also a member of Philadelphia high society. He wintered in Florida every year and was a friend and Wyncote neighbor of department store magnate John Wanamaker (1838-1922). He was a man of means. Yet, an 1899 biographical article about Selser notes that his Quaker-descended wife Pauline (nee Hallowell) (1866-1957) was the only one who placed the labels on his purported 40,000 pounds of honey sold for the season. Perhaps this frugality in not hiring help explains the crux of the text typed five years later on Mr. Selser’s letterhead. As inferred by the title to this post, Selser wrote Mohonk retreat manager Smiley to inquire about a “not desirable” cheap room for a good price in early September. He mentions his wife and also his ten-year old daughter (Margaretta, 1893-1918) who would “sleep on a cot.” The time period requested would be after the busy month of August when the season’s trade of honey would have been bottled (and labeled by Mrs. Selser). Apparently the delightful time at Smiley’s retreat did not require a comfortable room. Today, the retreat known as Mohonk Mountain House continues as a premier leisure destination and is still under the management of the Smiley family. Although written correspondence about room availability has long since been superseded by the internet, Mohonk as a summer destination spot has not. From a bee farm in Jenkintown, PA to a retreat in Lake Mohonk, NY, this letter and its material and cultural histories are threads of the matrix of the quotidian past that continue to resonate. The narrative typed on the stationery is an irreverent ode to the lives of its correspondents, everyday responsibilities, and summers of yore. Ancestry.com accessed on April 18, 2018. “Bees’ Stings in Medicine,” Pacific Medical Journal 47 (1904), 694-696. “High Pressure Gardening,” Gleanings in Bee Culture (September 1921), 582-585. “Mr. William A. Selser and Family,” American Bee Journal 44 (November 2, 1899), 689-690.